I’ve always been a beach girl even though I was born and raised in Oregon, and the beach here is just a freezing cold “coastline”. The first time (and only time until recently) I went surfing I was about 10 years old on a family trip to Hawaii. I don’t remember much but apparently I actually caught a wave! 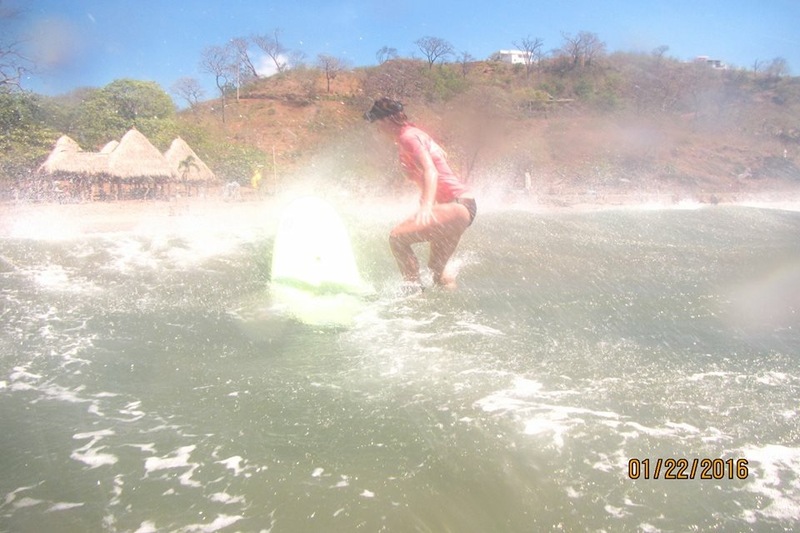 I think the extent of my surfing was standing on the board and riding the wave in, but at least I stood up! 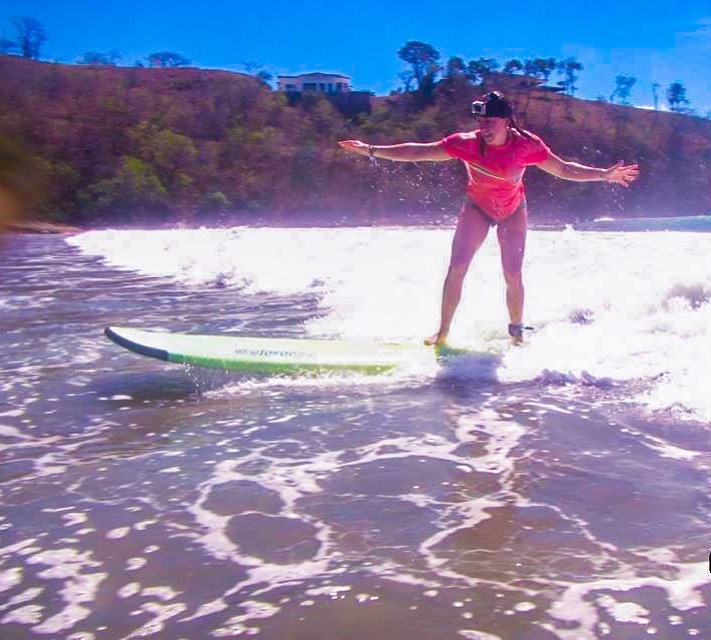 Tip had not surfed before and I was longing to go again, so while we were in Nicaragua I made sure that we took some surfing lessons. 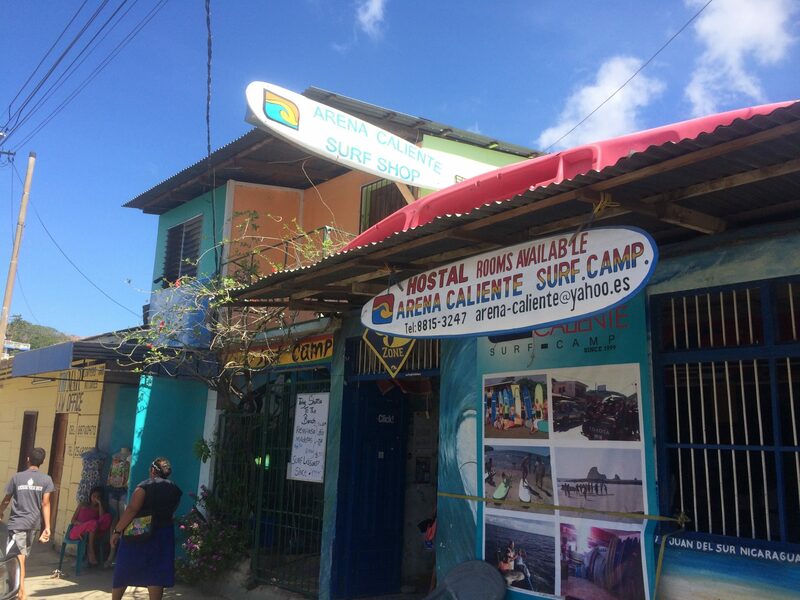 We contacted Arena Caliente Surf Camp, a local surf camp in San Juan Del Sur and we were all set for lessons. Even though we had huge 8-9 feet waves the day we took our lesson, we both were able to ride some waves and soon enough we’ll be making our pro debuts! Here’s everything you need to know to learn how to surf like a local. We set up lessons with Arena Caliente the day before, they picked us up from our villa, picked up a board and took us to Playa Remanso. It was just the 2 of us doing lessons, and we each had our own instructor, which was awesome! Usually there are multiple people with different skill sets, with one instructor, which makes it hard to really get the most of the lesson. But these guys were able to focus on us and really give us some good tips to ride the waves. It also helped that they told us which wave to ride and when to get up on the board! They also took photos of us for free! If you’re taking lessons the instructors will go over the surfing basics on land first. Like where to lay on the board, how to get on your feet, nice athletic stance as you’re riding the waves. They won’t put you in the water until you’ve mastered the basics. Ladies you need more than just a bikini! That thing will fly right off once you’re thrashed by a wave! Most places will give you a rash guard if you are doing lessons. You just throw it on over the swimsuit and helps protect your skin from the board. Make sure you have some good swim bottoms that aren’t too flimsy or are too loose. Men can pretty much wear type of board shorts but also make sure they can’t fall off. We don’t want the waves taking your pants off! You can’t paddle softly. When they say to paddle, you paddle like your life depends on it. Your strokes should reach far out in front of you and dig deep into the water. As the waves get bigger, it moves faster, which means you must be paddling just as fast to keep up! Make sure to place your hands on TOP of the board before you pop up, not on the sides. You will basically do a pushup to get off the board. Once you’ve put your hands on the board you have to pop up onto your feet quickly, or you’ll miss the wave. If you dont get up fast enough, it will throw your weight off-balance. For me, this was the hardest part, but luckily I had my instructor telling me when to get up! It’s all about practice and getting comfortable knowing when is the best time to stand up. If you get up too early, you will miss the wave. Once the board feels like its gliding on the wave, that is when you want to stand. Prepare to fall off AT LEAST a couple times! You think those pros became good overnight?! Get out there and get to work! As for us, we will definitely be practicing our surfing again soon! 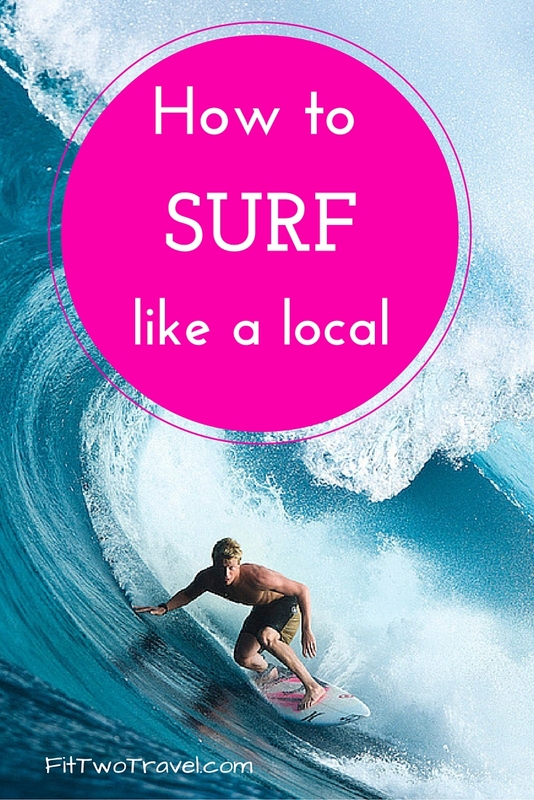 Now you are ready to surf like a local! 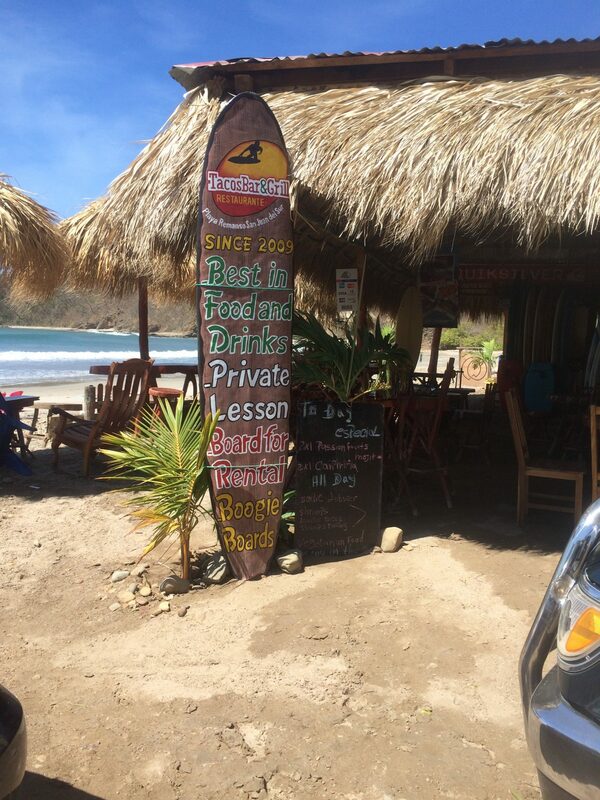 **If you happen to be in Nicaragua, check out Arena Caliente! Lessons were $30/person for pickup/dropoff, board rental and 90 minute lessons. They were really awesome, not only with the lessons but just overall friendly. As I mentioned we lost our GoPro, but both instructors were willing to help us look in the water for almost an hour. And even after we had thrown in the towel and headed back to town, Hamir told us he would be coming back to the beach later and would continue to look! They really were great people and instructors! Pretty cool! And been trying to windsurf in big waves like that, real tough! Wow, looks like a lot of fun. Have never surfed and would love the experience. Great tips about the bottoms for women. Fun pics! I think that the most important parts are paddling and getting up quickly, for sure. When to catch the wave you can fudge a bit as you get better at surfing, but getting up was my greatest obstacle. That looks like so much fun! 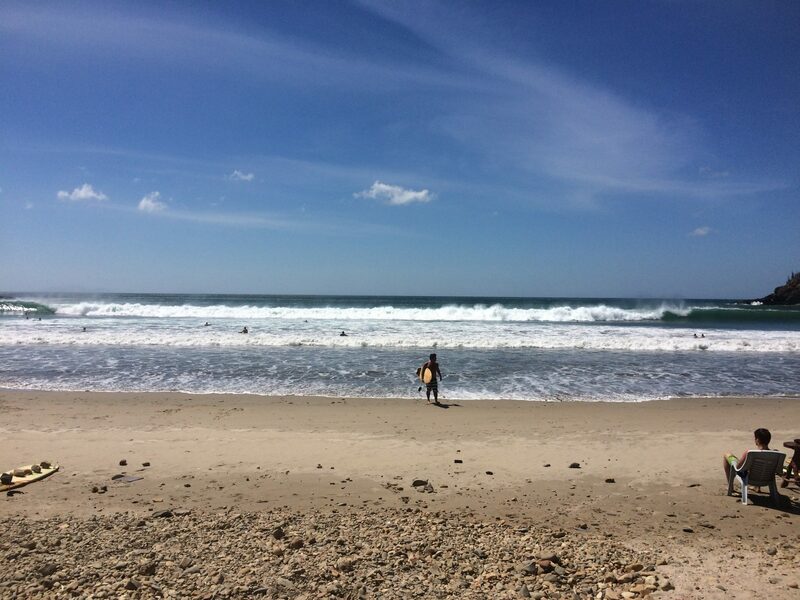 I tried surfing in the Dominican Republic and it really too me a while to get the hang of when to actually catch the wave and also when to know the wave was mine. I know it’s semi-irrational but I think my fear of sharks is going to keep me from surfing anytime soon. Lol. Sorry to hear about your GoPro! Part of me really wants to go surfing and part of me is so scared of drowning which is mostly because of a childhood incident in Hawaii, but I think I’d be more mad at myself if I didn’t give it a go! This is great! Because my Spanish is terrible, I accidently told someone that I knew how to surf… now my colleagues want to take me surfing. Now I need to learn! I love it! This will definitely be on the list while my boyfriend and I are backpacking Central Am in the next couple of months. I have only attempted to surf a couple of times but loved it. Ha, I LOVE this post! I can’t wait to return to Central America and play in the waves 🙂 Thanks for the reminder! Shakaaaaaaas! Surfing is so difficult to pick up – I think to surf like a local you’ll need at least a year studying the waves in an area. Great intro post! Will share! I really wanted to take a lesson when I was in Nica, but with my ultra-expensive contact lenses, I’m afraid to take the plunge ( pun intended ). Did you make it to the Corn Islands when you were in Nicaragua? RIP Go Pro :(. But great pics! I always thought that surfing is a natural talent – cool to know that you can just go in and try it out. Also great tip about not just wearing a bikini! I have always wanted to learn how to surf every since I watched a certain movie over and over and over lol. I’ve always thought this is an amazing sport and skill to learn. You must feel so free! I can almost definitely guarantee id fall over on the sand part let alone on the water. 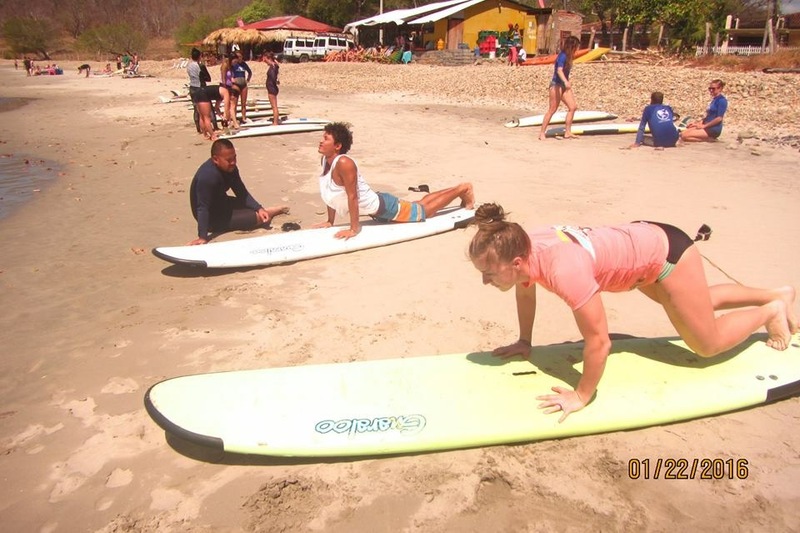 Sounds like you had fun, we attempted tp learn to surf in El Tunco, El Salvador but it was way too rough. Watching the locals was something else though, they were amazing! Surfing is SO hard. I just can’t get the hang of it. I tried for the first time in Oregon (what are you saying about the “coastline? !” We got a real true, surfer’s ocean there! :), and couldn’t catch a wave. Then I tried again for several days in Costa Rica and still couldn’t get the hang of it. Perhaps it’s just not my sport! Good on you for giving it a shot! I have never been surfing before. Loved Reading all the steps on how to surf before taking a lesson so I know what I’m getting myself into! I love watching people surf. And I would like to learn it. But sometimes I think I’m too old for it. Reading this I started to think again… I may should try it. Very handful tips for a newbie to get them started surfing.